As the deadly phenomenon repeats and expands amidst the world’s most densely populated cities—carving apartment buildings in half, scooping away entire city blocks, and claiming thousands of lives—Jack Sigler, Callsign: King and his black ops team take action. But the team is broken, spread across the globe and vulnerable. Scrambling to make sense of the violent disappearances and fighting to reunite, the team comes face-to-face with an otherworldly enemy capable of making the fearless...terrified. 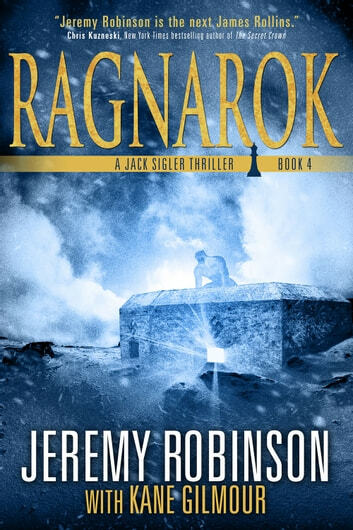 Ragnarok is the fourth full-length novel in the Jack Sigler/Chess Team series, following Pulse, Instinct and Threshold, as well as the prequel novel Prime, and eight standalone novellas focusing on the individual characters in the series. "Robinson blends myth, science and terminal velocity action like no one else." "Just when you think that 21st-century authors have come up with every possible way of destroying the world, along comes Jeremy Robinson." "There's nothing timid about Robinson as he drops his readers off the cliff without a parachute and somehow manages to catch us an inch or two from doom." "Jeremy Robinson is a fresh new face in adventure writing and will make a mark in suspense for years to come." "Jeremy Robinson is an original and exciting voice." "With THRESHOLD, Jeremy Robinson goes pedal to the metal into very dark territory. Fast-paced, action packed and wonderfully creepy! Highly recommended!" " [SecondWorld] is gripping, propelled by expertly controlled pacing and lively characters. Robinson's punchy prose style will appeal to fans of Matthew Reilly's fast-paced, bigger-than-life thrillers, but this is in no way a knockoff. It's a fresh and satisfying thriller that should bring its author plenty of new fans." "A brisk thriller with neatly timed action sequences, snappy dialogue and the ultimate sympathetic figure in a badly burned little girl with a fighting spirit... The Nazis are determined to have the last gruesome laugh in this efficient doomsday thriller." " Relentless pacing and numerous plot twists drive this compelling stand-alone from Robinson... Thriller fans and apocalyptic fiction aficionados alike will find this audaciously plotted novel enormously satisfying." Excellent book. Love Jeremy's books, all of them. I think this is the best book in the Chess Team stories so far. The team is back together, fighting other worldly creatures to save the world. I couldn't put it down. 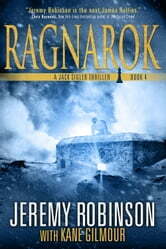 Ragnarok, the first Chess Team novel after the Call Sign novellas, is simply fantastic. The team is back together, mostly, and as everything comes to a head, you will ask yourself how you missed all of these books until now. I carved through this one in a weekend, and it was very cool. Strongly recommended! Now onto Omega! Fast paced...good read. But alittle too many battling scenes with dire wolves.